Also named Breeders by some, Nymphs are the only Dryads able to celebrate the Union of Flesh; they are the only ones able to bear children. 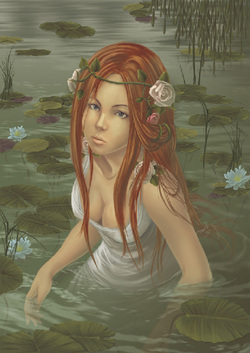 Nymphs are closely monitored by the Dryads, and none are allowed to leave the city of Lissera, save those given special permission of the Queen, Ysseyra. Nymphs have limited control of Nature, unlike their Druid siblings, and have little to no knowledge of the outside world. Many who have had the bravery to either defy their Queen or leave the city find themselves at a loss, for the world views birth and conception far differently than a Nymphs, who view the Union as a thing of pleasure, not love.